A small homestead in western Nuerland consisting of a cattle byre (luak), sleeping hut (to right) and a partially collapsed sleeping hut to the left. A few tethered cattle are visible standing near the sleeping hut. At the entrance a buor firescreen and windbreak can also be seen. Note on print reverse ms pencil - "W. Nuer 6" & print front border ms ink - "NUER IV/62"
Morton, Chris. 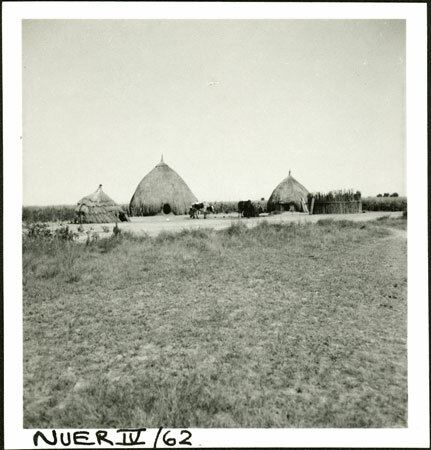 "Nuer homestead" Southern Sudan Project (in development). 03 Jan. 2006. Pitt Rivers Museum. <http://southernsudan.prm.ox.ac.uk/details/1998.355.179.2/>.